MARINA DEL REY, CA--(Marketwire - April 16, 2010) - Daylight savings time means even more time outdoors for residents at Esprit Marina Del Rey apartments, one of the newest and most desirable waterfront apartments in Los Angeles -- minutes from Santa Monica and Venice Beach. With an added hour of daylight, springtime is particularly enjoyable at a property designed for easy access to water sports and outdoor fun. 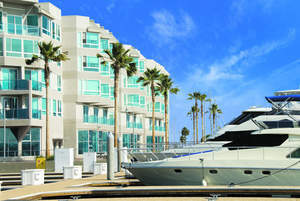 Residents take pleasure in the delightful Southern California weather, achieving personal fitness goals by taking advantage of Esprit's complimentary weekly exercise classes featuring Yoga and Bodycare Conditioning, as well as full access to the heated saline pool; free beach cruiser rentals along the waterfront promenade; and kayak storage space, Sea-Doo and other personal watercraft dock rentals right on the marina. Esprit also provides plenty of indoor activities with a 2,300 square foot state-of-the-art fitness center including extensive weight training and cardio equipment; a multipurpose sport court for racquetball, handball and basketball; and sauna, massage rooms and multiple spas to relax after every work-out. And for a post work-out reward, residents mingle at invite-only, Esprit-hosted poolside events like the popular martini parties and wine and cheese tastings. Esprit also brings a convenience unique to very few apartment home communities: residents are encouraged to pay rent online using their American Express® or other popular credit card without a service fee. This exceptional perk allows residents to reap all the benefits including accumulating miles, points and other rewards on their credit cards. Esprit residents appreciate other comforts and first-rate amenities right at home as well, including an event room with a full kitchen for private parties; a screening room for movie and game nights; a cozy library with marina and pool views; and the newest, most popular feature -- Esprit's poolside "Click Café" -- a fully-equipped outdoor kitchen, barbecue and wet bar serving complimentary coffee and newspapers daily. The property's premier concierge service handles everyday or special-occasion needs from making dinner reservations to party planning. Esprit apartments showcase townhouse-style living and water views from every apartment home. More than 25 floor plans offer studio suites to three bedrooms, unique live/work spaces, private balconies and rooftop terraces. Esprit also offers ample secured, underground parking for residents and guests. With lush courtyards, seven pet parks and a waterfront promenade ideal for cycling and jogging, residents enjoy an active, social lifestyle while always taking in a picturesque panoramic view. Esprit has a limited number of apartment rentals still available -- including brand new, never-lived-in suites. Visit EspritMDR.com or call (866) 734-0051 to book your tour. The newest Esprit commercial gives a glimpse of the spectacular views residents enjoy from every floor plan, and the unique indoor and outdoor privileges that give a completely new meaning to home. Esprit, Los Angeles' newest, most luxurious and unique apartment community, offers first class amenities and breathtaking water views from every floor plan.